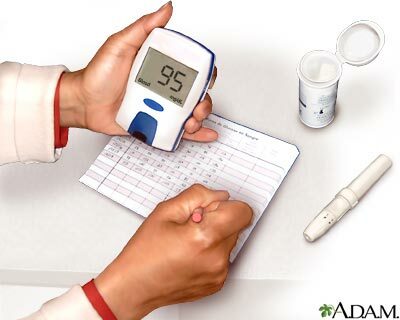 Sometimes a person with diabetes may have symptoms of low blood sugar levels, but blood sugar levels are not actually low. This is a called a false reaction. 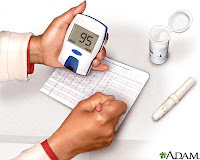 The hormone adrenaline is not just released when blood sugar drops too low — it's also released when blood sugar levels fall quickly when they're too high. When having a false reaction, one might actually have blood sugar levels in a healthy range but feel as if there is low blood sugar. Testing blood sugar levels before treating yourself for hypoglycemia can help you figure out if you're having a false reaction. Since I had a "dizzy incident" last time I worked out, I decided to test this time around to make sure everything was okay. My blood sugar was 154 in the parking lot before going in to work out. Roughly thirty-five minutes later, I was feeling a little light headed and a little nauseated. My heart rate was up but I was in the middle of a working out. Anyway, I took my blood sugar reading and it was at 90. I took a few sips from Chandler's smoothie, did some lunges and then decided to call it a day. I started to feel even worse so I took a few more sips of Chandler's smoothie. By the time I got home, my blood sugar was 108 but I was still having a few symptoms. It isn't that 90 is a too-low number. It isn't. It is the rapid drop that is causing the issue. Next workout is Friday and I plan to eat some fast-acting carbs/sugars prior to working out in hopes of avoiding a false reaction/rapid drop. Hahahah! Great idea! I am sure my PT would totally dig that.